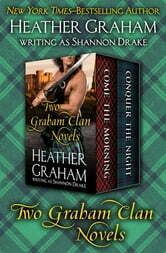 The first two novels in the medieval Scottish romance series from a New York Times– and USA Today–bestselling author, and an “incredible storyteller” (Los Angeles Times). Writing as Shannon Drake, Heather Graham turns her boundless imagination to her Scottish heritage, introducing the Graham clan, Gaelic-speaking Lowlanders who fight with their Highland brethren for the country they love. Come the Morning: A battle of wills is ignited when Lady Mellyora MacAdin of Blue Isle—a Viking warlord’s daughter and a formidable swordswoman—is forced to marry the Scottish warrior knight, Waryk de Graham. Conquer the Night: Revenge turns into unbridled passion when Scottish nobleman Sir Arryn Graham raids Seacairn Castle to steal his enemy’s intended bride, the fiery Lady Kyra.